There are a lot of options for redeeming your American Express Membership Rewards points — but which options give you the most value? This post will tell you which choices give you the most bang for your buck for your hard earned Amex Points and which offers are not. First off, in order to determine the best value of Amex points, we need a baseline to compare it to actual currency. It’s not uncommon to find redemptions with a 1:1 value; 1 cent for every American Express Rewards point. With a 1 cent/point value goal, that eliminates many of the inefficient programs offered by American Express. That includes Amazon Pay with Points (.7 cent/point), Offsetting a charge (0.06/point), and travel pay with points do not yield nearly the most efficient value. On top of that, don’t bother with the Amex Membership Rewards catalog. Most everything in the catalog is overpriced (by points), so when converting 1 cent/1 point, you are paying above retail (generally 0.5 cent/point). Toss the catalog in the garbage as you should if you’re looking for the most bang for your rewards. 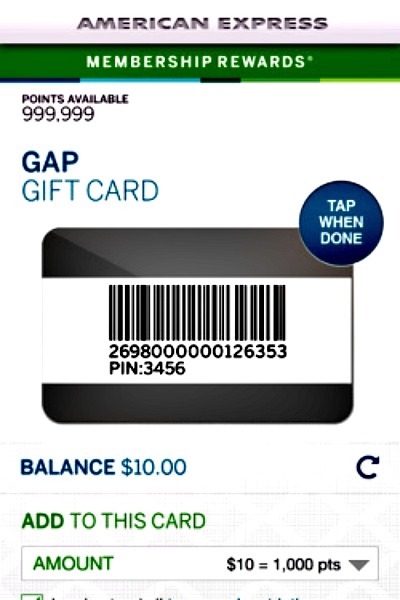 Of all the ways one can redeem their Membership Rewards points, the most common way to get the most mileage from your points is redeeming gift cards that offer 1 cent per American Express point. For these retailers and more, you can get varying denominations with a 1 cent for 1 Membership Rewards point. As far as normal redemptions go, gift certificates are the best value for your American Express Membership Points, but sometimes you can get even a better rate with Amex’s special promotion that puts gift cards on sale. I accumulated 250,000 AMEX points over the course of 6-7 years and didn’t redeem one point in all those years due to the lack of value I perceived from the available programs. However, when the 30% promotion came to me via a targeted email, not only did I think that was a good value for my points, but it was a steal. During that first gift card promotion, I redeemed nearly all of my 250,000 points for multiple Home Depot, Gap, and Crate and Barrel gift cards. Yes, I had over two thousand dollars in gift cards, but I figured if I didn’t use those certificates, I could sell them on eBay or a gift card reseller site for 85-90% of the value in cash.